Currently I am focusing only on Collaborative Family Law practice. Immigration services in Canada and outside of Canada. BK Law is a Mississauga based well-respected law firm. We at BK Law believe in professional excellence with innovative ideas to deal with client's cases in timely, effective and ethical manner. At BK Law our primary concern is to provide outstanding legal services to our clients. 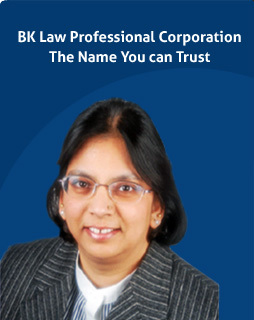 Ms. Balvinder Kumar, Barrister, Solicitor, and Notary Public has been providing quality legal service and personalized attention to her clients since 2007. Our Mississauga Notary Public section is helping clients with Walk In Notary Public Service. The information provided in this website is only for general and information purpose only and does not provide legal or professional advice. The material has been provided to encourage you to get involved to conduct more searches or contact to the right professional before making your decision. This is more to let you know that what services we can provide you and please do not consider it as legal advice nor presumed indefinitely up to date. While every care has been taken in the preparation of the information on this site, readers are advised to seek specific legal advice in relation to any decision or course of action. Use of this website does not create a lawyer-client relationship between you and BK Law Professional Corporation. If you send us an email and we do not already represent you, your email will not create a lawyer-client relationship and will not necessarily be treated as privileged or confidential. This website may contain links to other websites, Government or private for your convenience only. You may like to check these websites and their contents and our Law Office has no control over these websites and is not responsible for their content. Our inclusion of links to these sites does not imply any endorsement of the material or any association with them.